It was a survey being conducted in 1993 at Bermondsey by Richard Hill which became the catalyst for the next phase of development. Hill’s examination of the foreshore as part of a study for the Institute of Archaeology revealed prehistoric peat layers containing faunal and lithic artefacts, and the remains of a post-medieval shipyard. 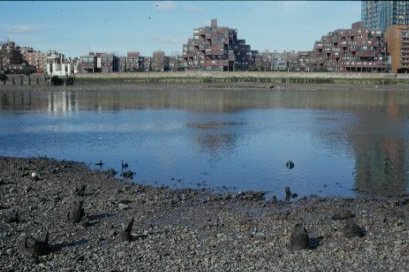 Also in 1993, investigations began on the foreshore at Vauxhall. A student team from the Institute of Archaeology led by Gustav Milne, together with Jon Cotton from the Museum of London, recorded a roundwood pile structure of oak, which was dated to the Bronze Age (cal 1750-1285 BC), and is believed to represent part of a bridge or jetty structure. 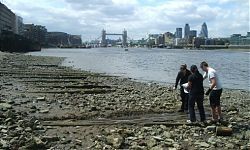 These projects further demonstrated the enormous potential for surviving archaeological deposits on the foreshore and led to the initiation in 1995 of a Pilot Study jointly instigated by the London Archaeological Research Facility and the Museum of London. 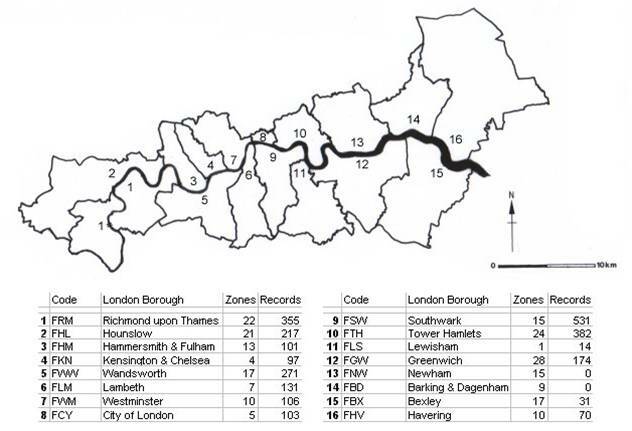 Five London boroughs were selected for survey: the City of London, Lambeth, Richmond upon Thames, Southwark and Wandsworth, and a part-time Survey Officer, Mike Webber, was appointed to co-ordinate recording work undertaken by local archaeological societies and students from University College London. 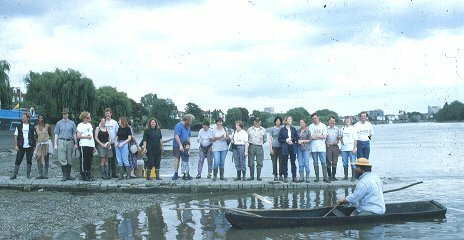 The aims of the Pilot Survey were rightly ambitious; in addition to recording the archaeology of selected foreshore zones and providing information to the Greater London Sites and Monuments Record, the project endeavoured to raise public consciousness of Thames archaeology, to create links with other organisations with foreshore interests, and to plan for longer-term management of the cultural resource through monitoring of erosion in this dynamic environment. 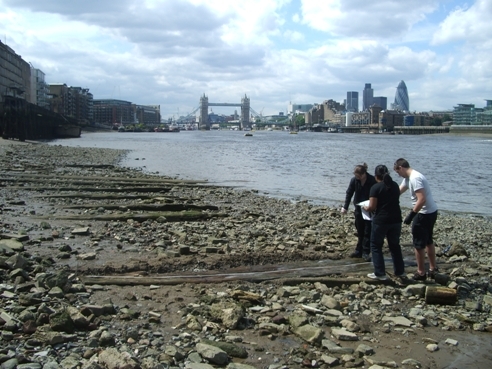 The methodology developed for the foreshore survey was threefold: after borough areas had been divided into ‘zones’ and allocated with an appropriate site code, an initial walkover or ‘Reconnaissance survey’ was undertaken in order to assess available access points and the condition of the shore. This was followed by ‘Extensive Survey’, where the foreshore was systematically ‘field-walked’ and archaeological deposits and structures were allocated alpha (α) numbers and approximately located on large scale Ordnance Survey mapping. Finally, ‘Intensive Survey’ of selected features was undertaken using pro-forma Museum of London recording sheets. This comprised the creation of a written, drawn and photographic archive. During this first phase of work, 31 zones were reconnoitred, four were the subject of extensive survey and two intensively surveyed (the Bermondsey site and a zone in Richmond). 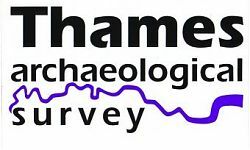 The success of the Pilot Study and in particular the comprehensive survey undertaken by the Richmond Archaeological Society led to the development of a three year programme of fieldwork (1996-1999), funded by the Environment Agency and English Heritage. Mike Webber continued as the full time Survey Officer, with part time Assistant Survey Officers Jon Binns, Nathalie Cohen and Alex Langlands. The foreshore of the tidal Thames from Teddington to Greenwich was extensively surveyed, with pilot studies undertaken on zones in Bexley and Havering. Over 2000 features were recorded, ranging in date from the prehistoric to the modern period. A number of key sites were recorded in detail. 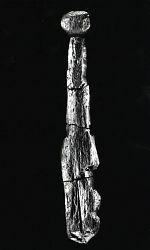 At Chelsea a Neolithic prehistoric forest of peat deposits and waterlogged trees, together with human and animal skeletal remains, was discovered. Excavated from within this context was a wooden club or beater (photo left) dating to 3630-3350 cal BC. The well preserved remains of a mid-Saxon fish trap (dated to 730-900 cal AD) were also found at the same site, and other examples of Saxon fish trap structures were recorded at Isleworth, Barn Elms and Putney. Further work at Vauxhall discovered part of an early Iron Age fish trap dated to 790-390 cal BC, while survey on the foreshore at Winchester Wharf, Southwark resulted in the recovery of a tiny Roman intaglio appropriately depicting a boat. 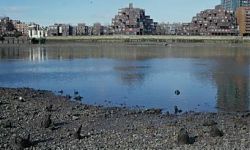 Other discoveries included the vestiges of jetties and wharves, including those serving the royal palaces at Richmond, and Greenwich, artefact scatters representing a variety of activities including boat building / repair / breaking and sugar refinery waste; gridirons and bargebeds, and the fragmentary remains of numerous vessels. 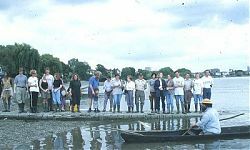 The project was also successful in its aim of raising the profile of the Thames within the archaeological community and the general public. Officers presented lectures to local societies, held a number of ‘Open Days’ on the foreshore, and organised a two-day conference, and a temporary exhibition at the Museum of London. 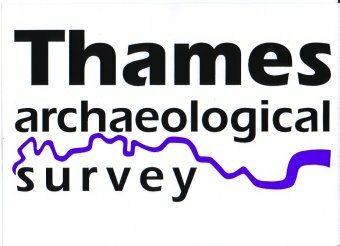 Funding for the Thames Archaeological Survey came to an end in 1999, and the project archive is providing the baseline dataset for the current archaeological investigations of the Thames Discovery Programme.